Try Virgin Coconut Oil for cold sores! 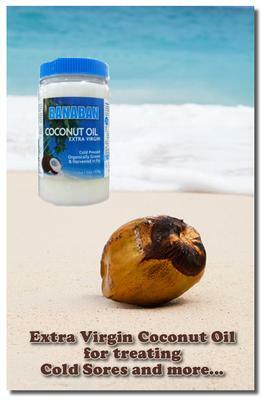 Virgin Coconut Oil (VCO) is a natural anti-viral and is very effective. Whenever I feel a cold sore coming on, I immediately breakout the VCO. I apply it to my lips like a lip balm as often as I remember to do it for about a day. That's all it takes for me! Thanks so much for sharing this great tip about using virgin coconut oil for treating cold sores. It's actually a really great idea, and one I hadn't thought about before. I've only started learning about the many health benefits of virgin cold press coconut oil in the last year or so. I probably never thought about it much because coconut was one of the very few things in life that I didn't like. :) I've tried over the years to develop a taste for it, but was never successful. I started reading and hearing about the benefits of coconut oil for weight loss, healthy cholesterol levels, heart health, etc. and finally started buying it and trying to incorporate it into my daily routine. in my oatmeal or (believe it or not) in my cup of coffee. Yes, it makes the coffee "oily" but it gives it a nice flavor. I've since learned of how good coconut oil can be for your skin and even have started to dab a little on my palms and rub it through my hair to give it a healthier appearance. Now you've given me the great idea of applying coconut oil to cold sores and based on your own experience, I'm eager to try it. The truth is that I haven't had a cold sore in a while (thank the Lord!) and I don't want to wish one on myself just to try this wonderful remedy, but I will definitely keep it in mind when the time eventually comes. Just a note to those who aren't familiar with coconut oil... Be sure that you buy extra virgin organic coconut oil that has been cold pressed and has no additives whatsoever. That's where you'll get the health benefits. Other coconut oils do not have the same beneficial properties. If you test out this cold sore remedy, let us know your results by using the comment link below!